These easy pancakes are fluffy, hearty, and delicious! They can be quickly whipped up in a blender and are made with wholesome ingredients. They're vegan friendly and free of gluten, dairy, and refined sugar. Add everything to blender and blend until smooth, about 30-60 seconds. Let batter rest for 3–5 minutes to thicken. Lightly grease a non-stick pan and place over medium-high heat. When pan is hot, pour pancake batter into pan using a ¼ or ⅓ measuring cup. Reduce heat to medium and cook until bubbles begin to form on the pancake. Flip and continue to cook until center is done. Makes about twelve 5-inch pancakes. *You can use additional rolled oats instead of the flour, but more milk/water may be needed. **Adding an egg helps gluten-free pancakes not be so dense, but they work fine without it. 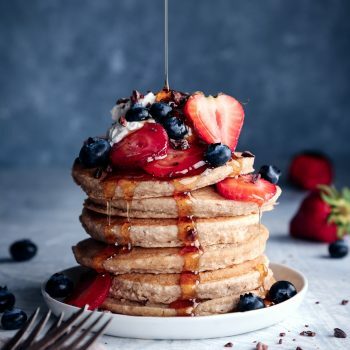 The pancakes pictured are made without an egg.